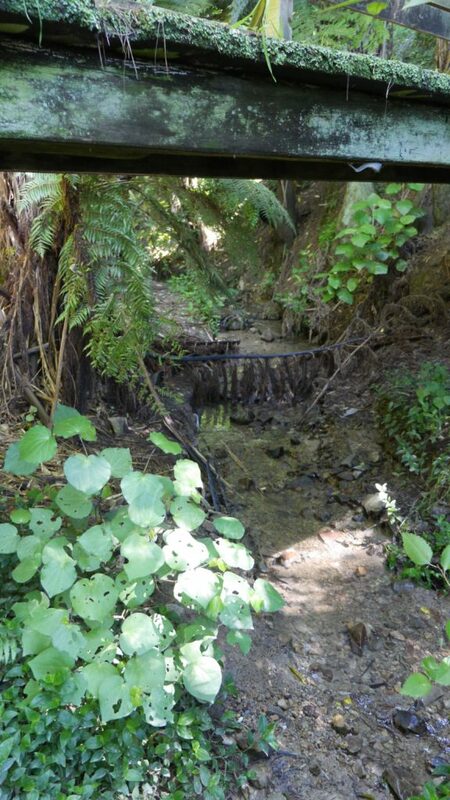 This blog post describes my first exploration up Papawai Stream, beyond the easily accessible footpath, on the search for where the water originates. Unfortunately, the camera I took on the way had no GPS so I cannot accurately pinpoint images from this first walk to a location in retrospect. It was an early Saturday afternoon, the weather was fair, early spring. I cross the lower playing field to enter Prince of Wales Park, which is part of the Wellington Green Belt, an outdoor recreational area relatively close to the city centre. On the sides of the field I can see the stream, surrounded by vegetation, almost hiding, but slowly gurgling away. 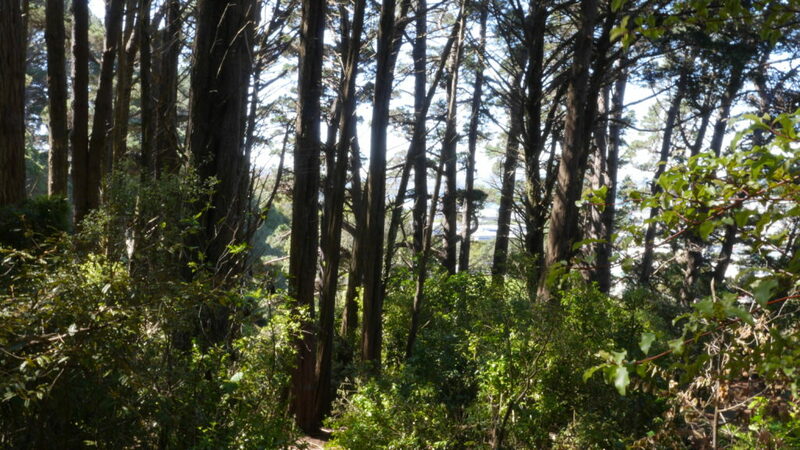 To follow its course further I take a walking path uphill, entering the shaded, forested part of Prince of Wales Park. 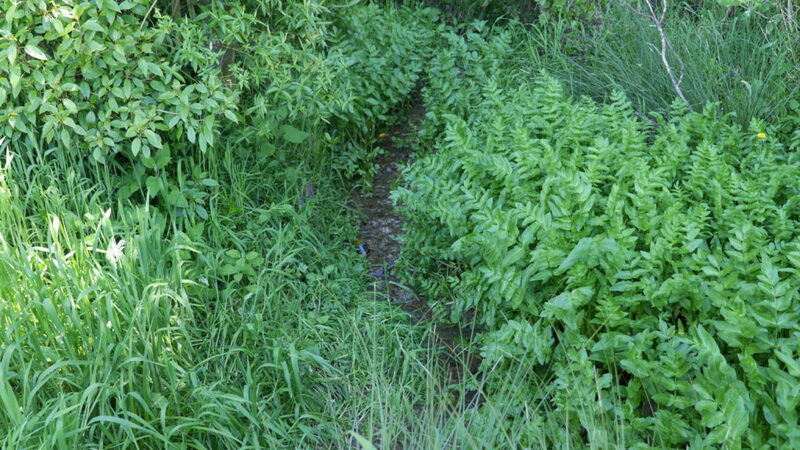 The stream is on the right side of the track, not easily accessible, but partly visible through the vegetation. I arrive at a bridge that crosses the stream. The stream is accessible from here, I would need to duck to walk underneath the bridge, but I choose to walk back up and use the more accessible way on the other side of the bridge. The bridge would lead me to a paved path uphill, leading up to Dorking Road, Brooklyn. 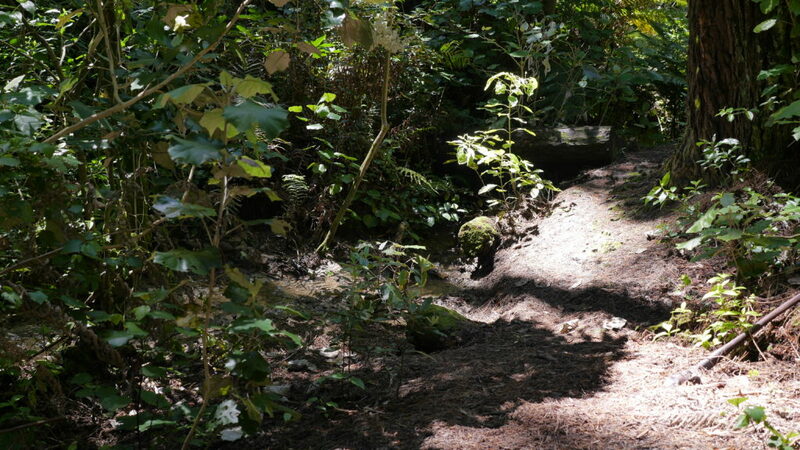 I, however, head south-west, following the stream on an unpaved walkway that at times resembles a small gully. 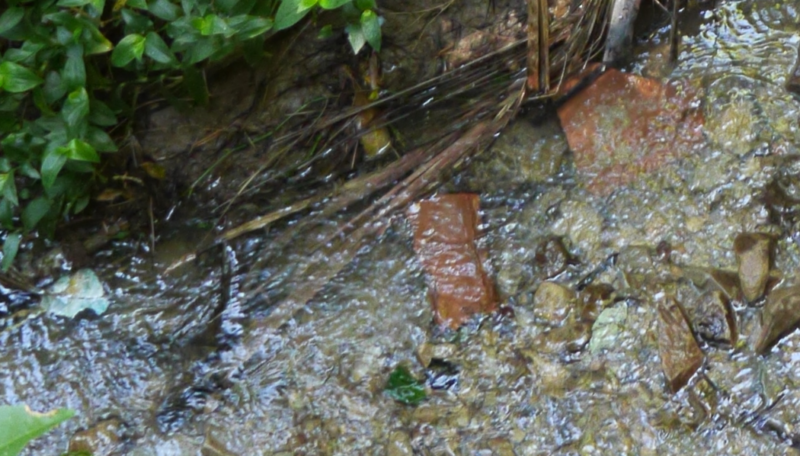 The stream bed consists of stone and gravel, but I notice some old red bricks, adding colourful highlights to the otherwise merely brown environment. Walking further upstream, I hear bird calls and creaking of trees in the wind. 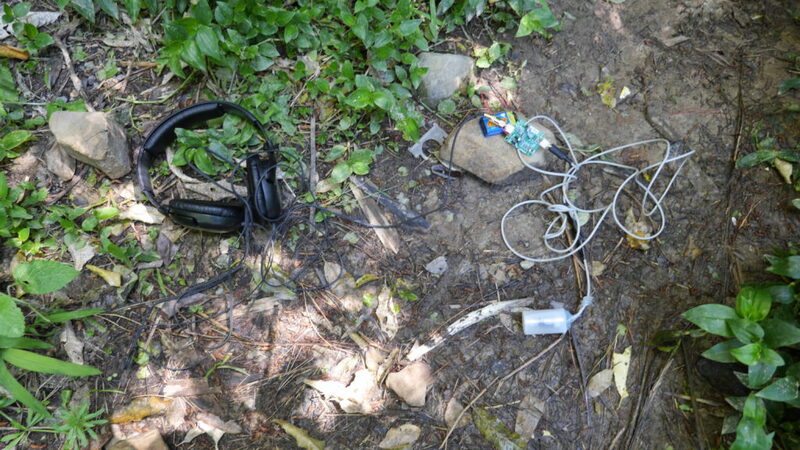 The stream is still visible and audible on the right side of the walking path, flowing a little lower than the walkway. 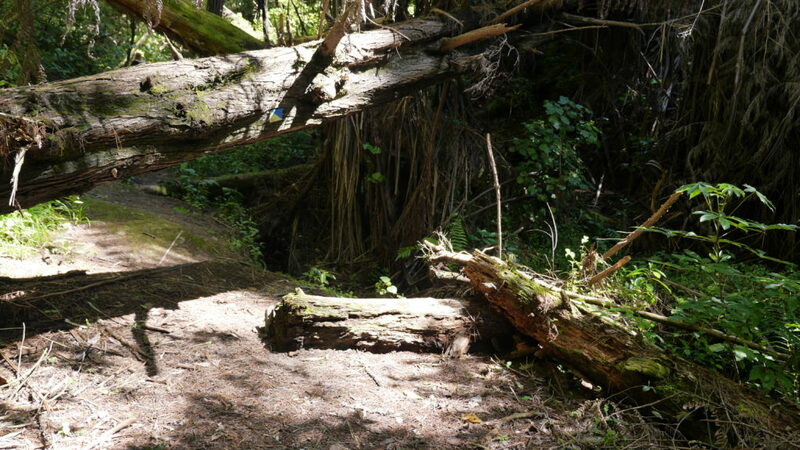 Fallen trees are obstructing the track further up but can be passed to continue the walk. The sun is coming through the trees at times and creates nice highlights of the landscape. The path is softly covered with pine needles and lined by green vegetation. 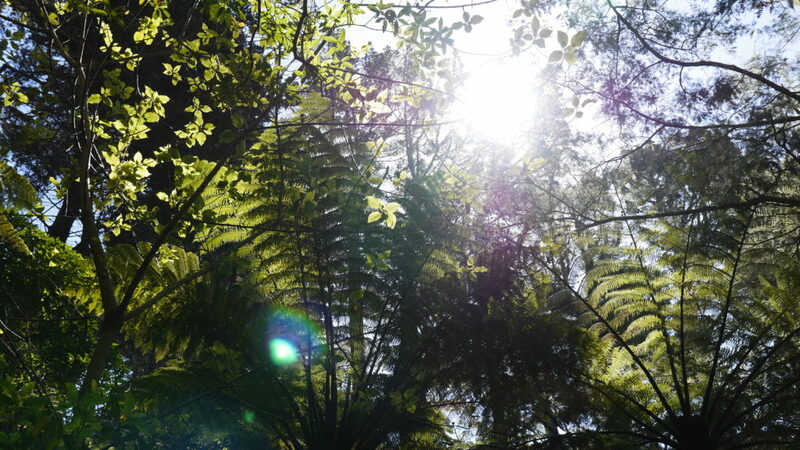 I see very tall pine trees and beautiful ponga/tree ferns. The track appears to be getting more rough, narrower and city noises have entirely disappeared from the soundscape. I hear the gurgling of the stream beside me, accompanied by bird song and the sound of the wind brushing through the trees. 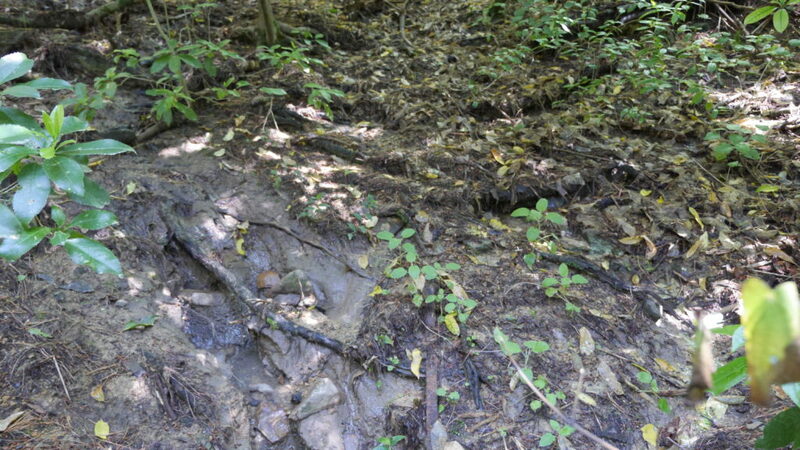 Walking further uphill, I notice the stream has suddenly disappeared. I head back down a few metres to reach the spot where the flow has died down and blends quietly into a brown boggy patch of forest ground. 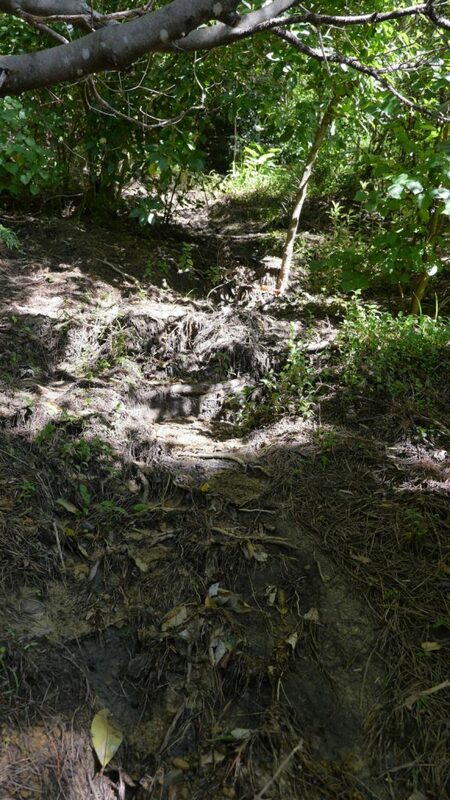 By the looks of the area, it seems this part has higher water flows, perhaps during or after heavy rains. The further uphill I walk the more trash I encounter, mainly bottles and plastic packaging often buried halfway in the ground. It appears the garbage is being moved further down as part of a mudslide. The territory is getting steeper, and accessibility starts getting to become an issue. I need to watch my steps as the ground is very boggy and slippery at times. I hold onto branches of trees for stability. The look of the territory suggests even stronger that a mudslide has brushed down the area recently, washing down earth and vegetation. I appear to reach the top of the hill as I can see more of the sky again. The boggy ground is littered with brown bottles and red bricks. I need both my hands to hold onto bushes and trees as I carefully crawl uphill so I cannot use my camera to take more photos. I see a pipe and what appears to be an old railroad rail, sticking out of the hill. I also see the bottom of a house, and I am not sure if I am on private land. There is no water coming from the pipe. I need to watch my steps, but I manage to reach the top of the hill. I end up on a street that – as I would later find out – is called Connaught Terrace. 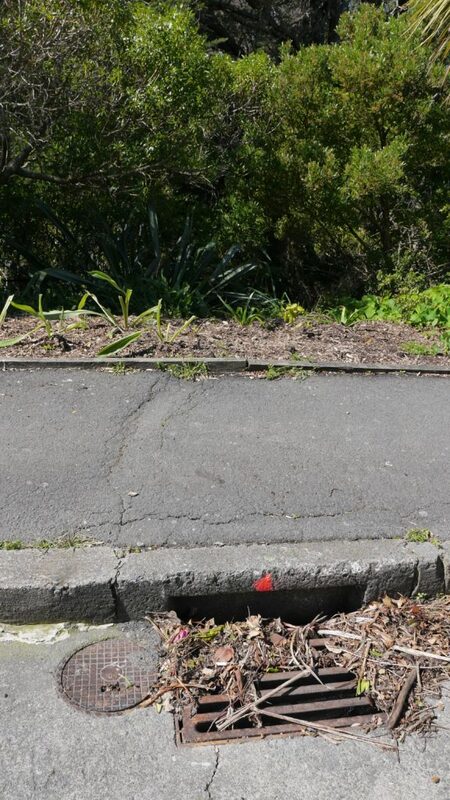 I end up coming up and out of the gully just next to the garage of private property. I look back down into the area I just came out. I mostly see grass and trees. I walk back to the street where I find a drain cover that must be part of the network of the pipe leading down to Papawai Stream. It is marked with a red dot. Leaves partly cover the grill. It appears this drain collects rainwater and runoff from Connaught Terrace, which would end up feeding into Papawai Stream. 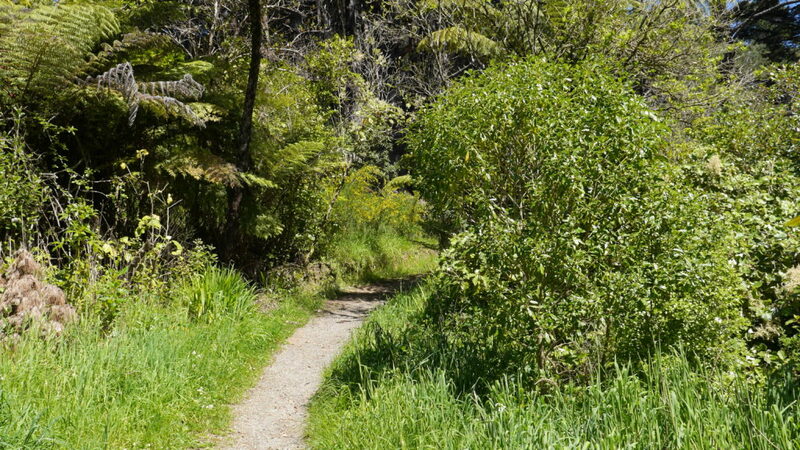 I notice an official paved path that ends up approximately 10 metres next to where I exit the reserve and decide to take this way back down to Mount Cook. 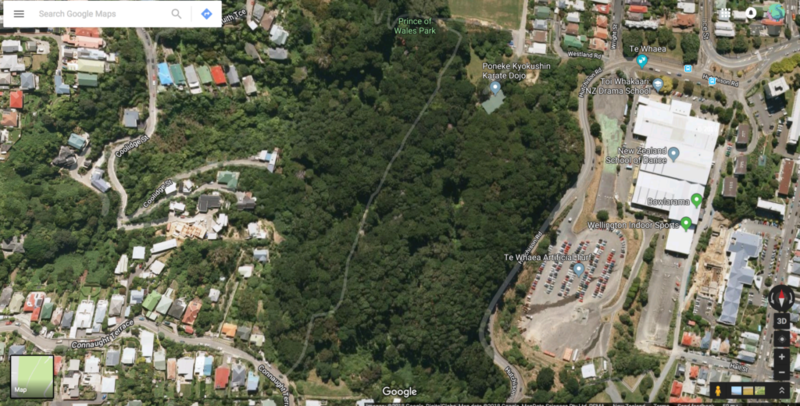 It appears this is the public path as marked on Google Maps, connecting the lower playing field of the Prince of Wales Park with Connaught Terrace. 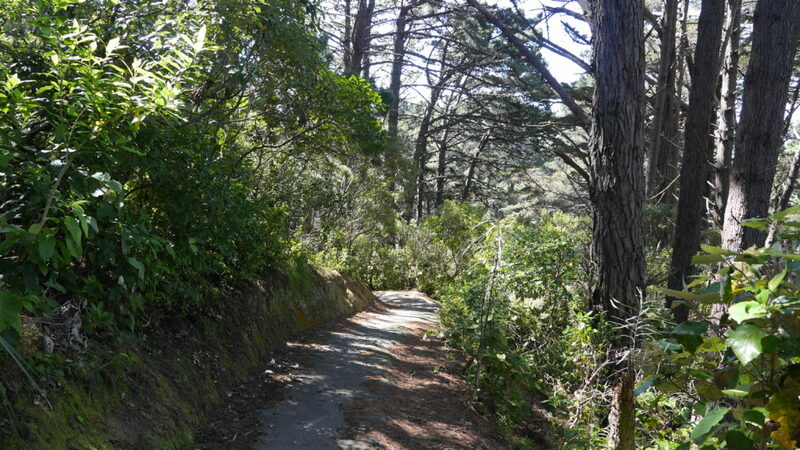 The above photo shows the paved walkway downhill, which is very different from the path I chose for my uphill adventure. Papawai Stream must be somewhere in a parallel valley behind the hill on the left side. On the right side, I get a good view through the pine trees to what must be the suburb of Newtown. 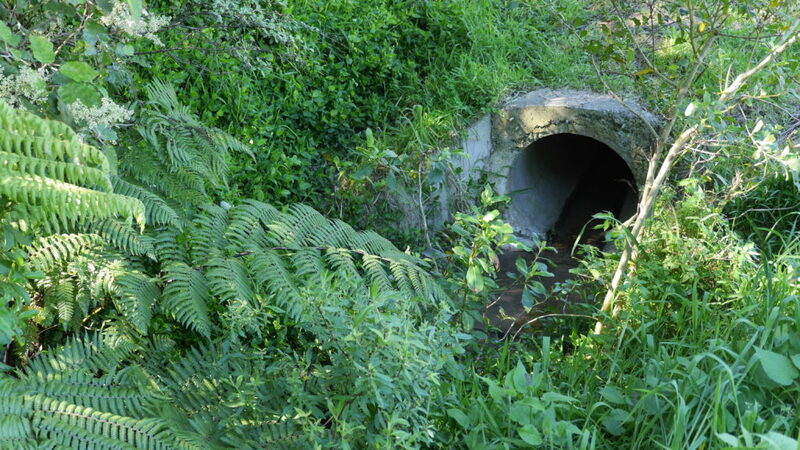 I end up walking back down to the fields, following the stream around the bund and snap another photo of it entering the culvert next to the playing field changing sheds. 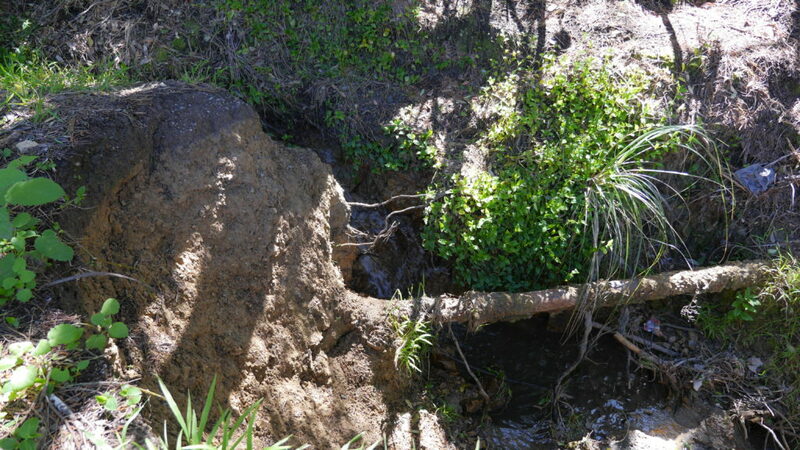 Further downstream it appears that there has been some significant event recently, causing washouts and uprooting trees. 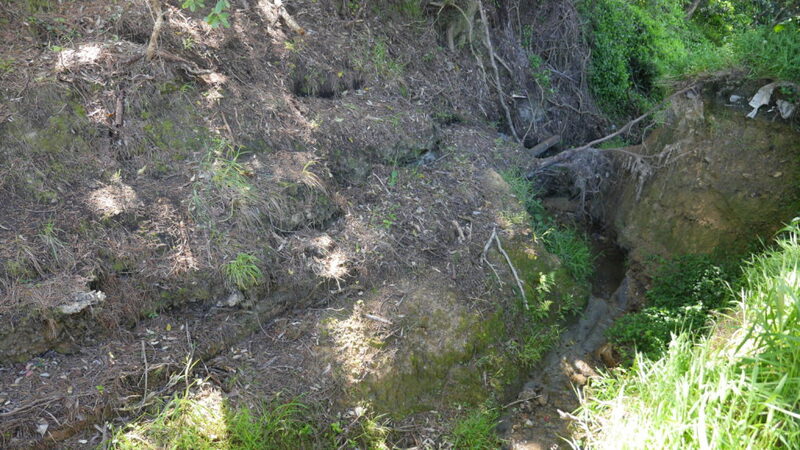 The stream is flowing through a canyon that appears to be the result of a washout, possibly after heavy rain. The stream bed is shallow. 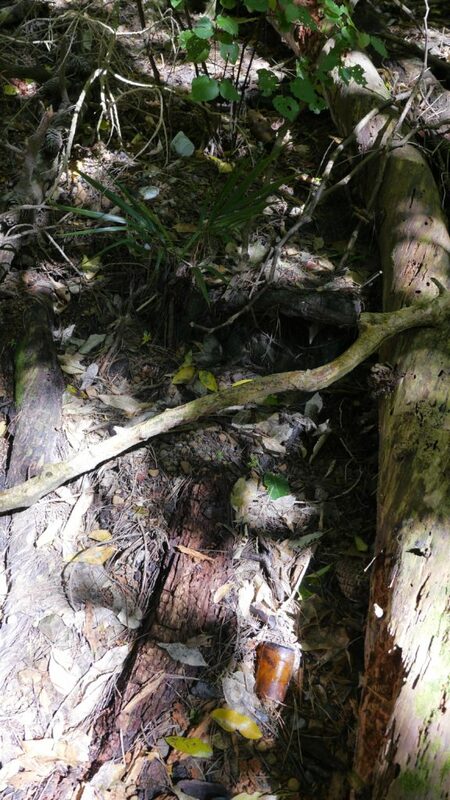 Vegetation has suffered from slides. I conclude my walk here having explored some of the more inaccessible parts of this stream. Connaught Terrace seems to be the highest point of the stream, but it is not entirely clear to me where the water is originating from. 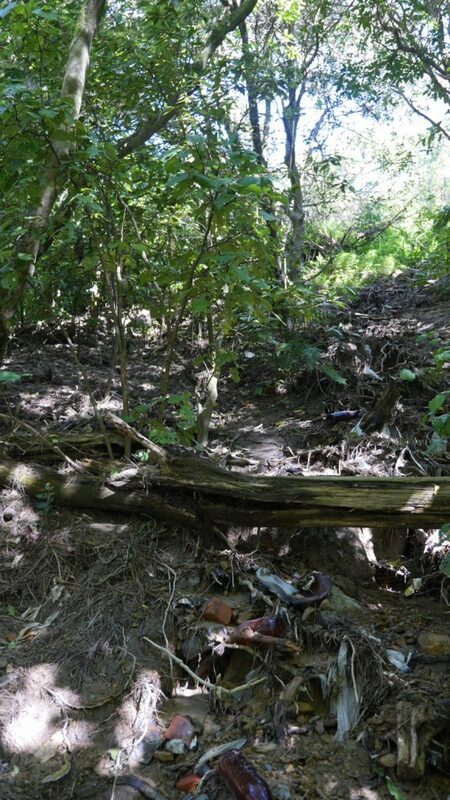 The area just about where the stream is losing flow has been particularly curious, as it appears that people are frequenting this area despite its inaccessibility. 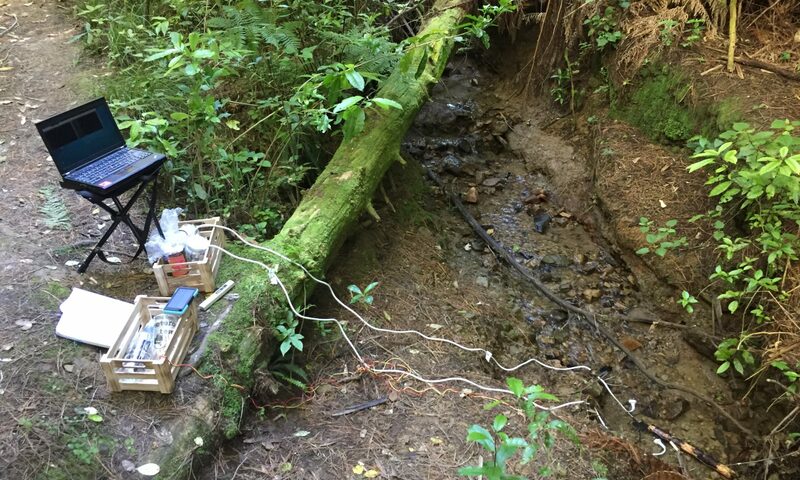 For this research I want to explore what kind of DIY electronics can amplify the voice of the forgotten streams in Poneke/Wellington, New Zealand. As a first device I want to build a hydrophone that can be used during fieldwork to record underwater sounds. Hydrophones used in scientific research, for acoustic monitoring, such as for tracking marine animals, are relatively expensive and even DIY solutions feature costly elements (see for example Dawson, 2012). 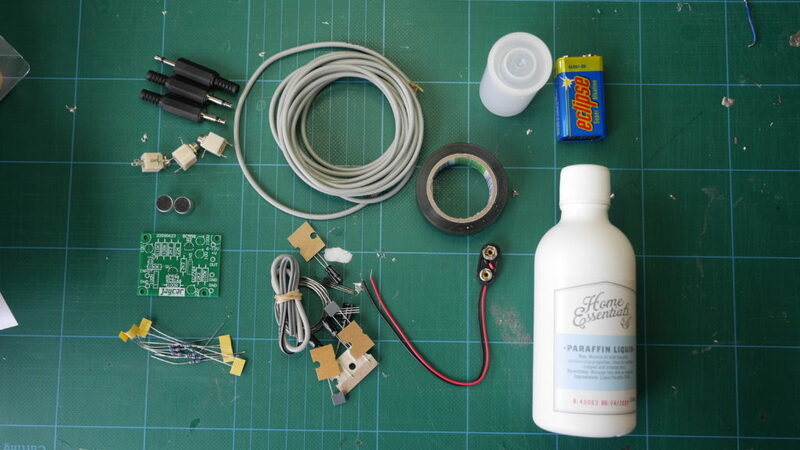 In low-cost DIY solutions old audio components, such as headphones or radios are re-used (e.g. digifishmusic, 2008) and made waterproof with silicone or hot glue. 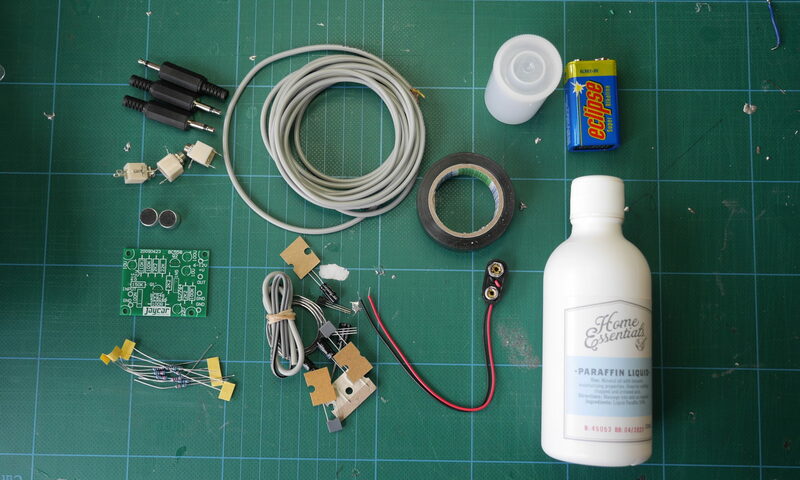 I decided to combine building a hydrophone based on two instructions. Both are based on using an electret microphone element as the primary component. In the instructions of Decker (2013) the element is enclosed in an empty film canister filled with mineral oil as a medium to optimize the hyrdophone. I chose this design for the first version following a suggestion on the Wellington Sonic Arts Facebook. The instructions by the University of Waikato (2011) feature a component list that is available in New Zealand. Building the first version of the hydrophone took less than a day and involved researching the best possible option to be done within one day, sketching a schematic alongside a shopping list of necessary parts, planning the quickest route around town to buy all necessary parts and then 2 hours of soldering and assembling plus some extra time for testing and troubleshooting and documenting along the way. 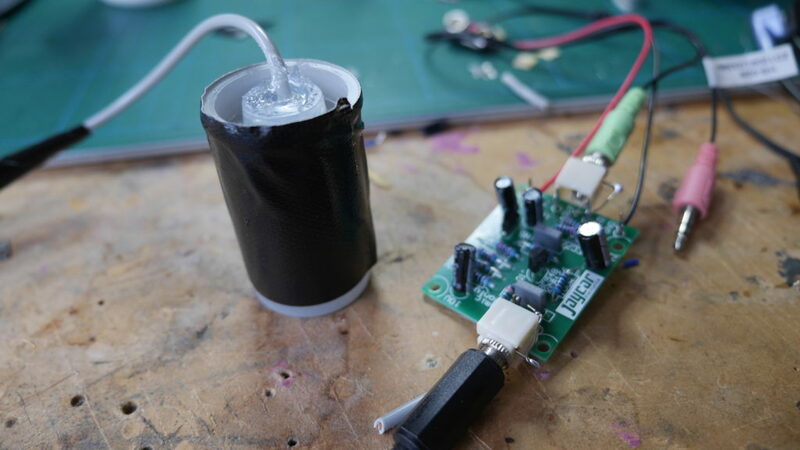 I built the hydrophone as described in Decker (2013) but used a 3.5mm mono headphone jack at the end of the 3 meter long cable. I also soldered 3.5mm sockets to the pre-amp for in- and outputs to keep the device as modular as possible. For testing the hyrdrophone I used a pair of headphones, but I will be looking into options for adding a speaker. 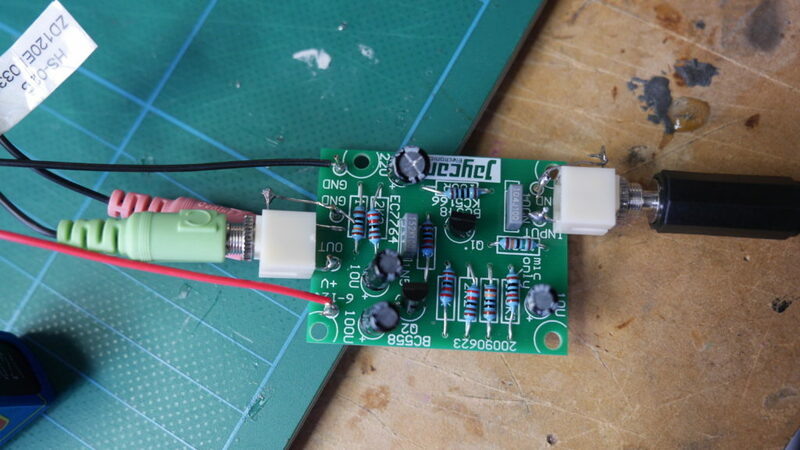 Currently, the pre-amp turns on and off by connecting and deconnecting the battery, which is cumbersome, so adding a switch would be a good improvement overall to be added to a (preferably waterproof) enclosure.